There are multiple search options available in Infocenter. Here you can find out how to perform basic searches and how to create custom searches using search scopes. 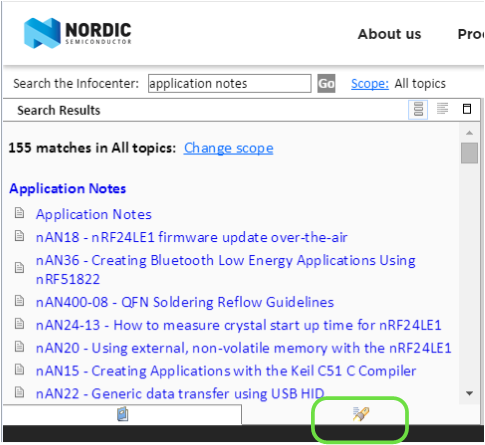 Use the search field above the left navigation pane to search within Infocenter. Type in your search query and hit Enter or click Go. The search results appear in the search results tab, which is indicated by the symbol. When you are finished searching, or would like to go back to the navigation pane, click the symbol. To the right of the Infocenter search field, you'll see Scope: All topics. This tool allows you to create tailored searches and to select or remove previously created search scopes. Click Scope. A dialog box appears. Click New. A new dialog box will appear. In the List name field, type a name for your search scope. From Topics, select the topics that you want to include in your search. Click the next to a topic to display the subtopics, if you would like a more narrow search. Click OK when you have selected all the topics you would like to include. You will now see your custom search selected in the Search scope list. Click OK to set your new search scope and close the dialog. You will see that the term next to Scope has changed to your search name. To search using your new scope, enter your search term into the Search the Infocenter field and click Go. This tool is also useful if you would like to reduce the amount of topics shown in the left navigation. For instance, if you're only working on nRF52 Series products, you could select nRF52 Series and nRF5 SDK from the topics and subtopics list.